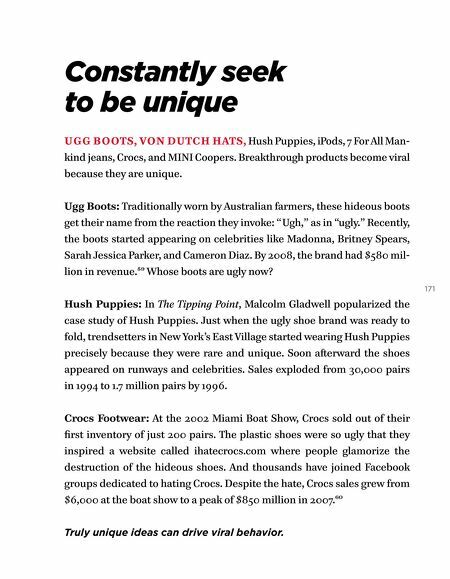 Constantly seek to be unique UGG BOOTS, VON DUTCH HATS, Hush Puppies, iPods, 7 For All Man- kind jeans, Crocs, and MINI Coopers. 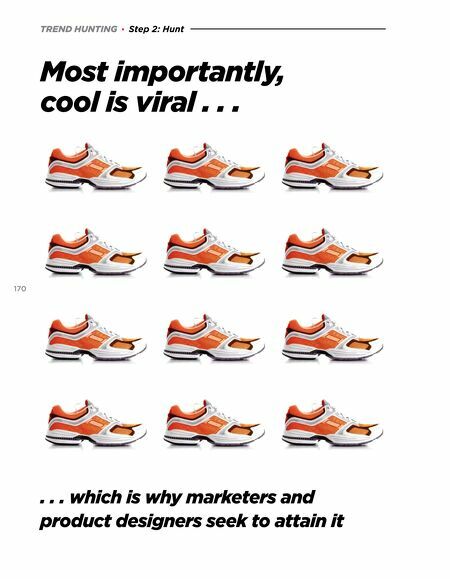 Breakthrough products become viral because they are unique. Ugg Boots: Traditionally worn by Australian farmers, these hideous boots get their name from the reaction they invoke: "Ugh," as in "ugly." Recently, the boots started appearing on celebrities like Madonna, Britney Spears, Sarah Jessica Parker, and Cameron Diaz. By 2008, the brand had $580 mil- lion in revenue.59 Whose boots are ugly now? 171 Hush Puppies: In The Tipping Point, Malcolm Gladwell popularized the case study of Hush Puppies. Just when the ugly shoe brand was ready to fold, trendsetters in New York's East Village started wearing Hush Puppies precisely because they were rare and unique. Soon aſterward the shoes appeared on runways and celebrities. Sales exploded from 30,000 pairs in 1994 to 1.7 million pairs by 1996. Crocs Footwear: At the 2002 Miami Boat Show, Crocs sold out of their first inventory of just 200 pairs. The plastic shoes were so ugly that they inspired a website called ihatecrocs.com where people glamorize the destruction of the hideous shoes. And thousands have joined Facebook groups dedicated to hating Crocs. Despite the hate, Crocs sales grew from $6,000 at the boat show to a peak of $850 million in 2007.60 Truly unique ideas can drive viral behavior.